At the end of July 2013, my husband Mike and I decided to pay off all of our debt, including our mortgage, as quickly as possible. We still have a long way to go before we are completely debt free, but in this three-part series, I am taking you through exactly what we did to pay off over $65,000 from August 2013 through June 2014. If you missed Part 1, you can check it out by clicking here. If you want to skip ahead to part 3, go here. Once we created our Debt Snowball and started living by a budget, it was time to kick things up a notch. We reviewed every line of our budget to determine if each expense was really necessary. As much as I don’t like finding spiders in my house (or anywhere, for that matter), we made the decision to cut Terminix from our budget. I began clipping coupons and second-guessing the necessity of some grocery purchases. We stopped buying snack foods, like pretzels and chips, and drinks, other than coffee and milk. We started making crockpot freezer meals, which saved us time and money when planning dinner. And we began narrowing down our grocery lists. This not only saved us money but calories, as well. Win-win! Mike started taking the bus to work instead of driving to save on gas, and I became aware of how my driving affected our gas mileage. I began driving the speed limit instead of a little bit over and took pleasure in seeing the MPG meter on our car tick up. I tracked every single expenditure on our budget spreadsheet and constantly looked for areas where we could save money. While our ultimate goal was to pay off our mortgage by the time we turn forty, our primary goal was to pay off all of our non-mortgage debt by the end of 2015. With this in mind, we knew we had to be intense. Mike made a lot of sacrifices for our goal, including selling his 2004 Subaru WRX – his first nice car that he bought after he graduated from college – and his motorcycle. We had no problem finding a buyer quickly for the WRX so before the month of August ended, we sold his car for $10,500 and bought a cheaper secondary vehicle. We sold his motorcycle in March 2014 for almost as much as we had paid for it three years earlier. We considered selling our 2011 Toyota Prius, which was my first nice car, but decided against it after my husband was rear-ended while driving it home from work by an uninsured motorist in September 2013. We didn’t want to take the drastic hit in depreciation of value and trade it for a less reliable, cheaper family car. Fortunately, Mike wasn’t hurt, and we received $4,000 from the insurance company for the inconvenience, which added to our debt payments in May 2014. Also in August 2013, we held a very successful garage sale, where we earned almost $1,600 for two days of work. In preparing for the garage sale, we turned our house upside down to find as many items as possible that we wouldn’t mind parting with. We knew that not everything would sell and offering a variety of items would attract more “lookers” to our sale. Since August, we have sold things that didn’t sell at the garage sale at a local consignment shop and through Craigslist and eBay. Some of the things we’ve sold have been brand name handbags, clothes, couches, chairs, lamps, dressers, jewelry, and a barely-used Gold’s Gym weight set that took up an entire room of our house! We had a smaller garage sale in June 2014, but for a couple of hours of work, we made a couple hundred dollars! We still have a lot more things that we would like to sell. Our goal is to simplify our home so if we don’t need it, love it, or use it, we try to sell it or give it away. I’m assuming that you are reading this article because you are on your own debt repayment journey. 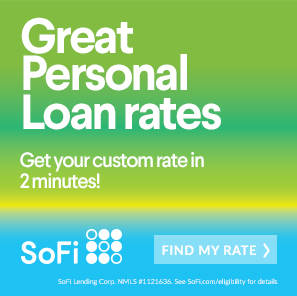 If thats the case, consider refinancing with SoFi. They have a great business model and competitive rates. So, if you’re paying more than 10%, you might consider giving them a call. Surf on over to their page or here or check out the banner below. We have an automatic deduction from our checking account to our savings account every month. It builds our savings without us ever worrying about having to move it over. It doesn’t have to be much to grow to something bigger. Thanks for your tips! That’s great, Bonnie! Automating savings is a smart move! Thanks for reading! Thank you for this. As a family that just decided to go from two incomes to one, insight like this is really helpful. Thanks! I’m glad you enjoyed the article, Kristi! Going from two incomes to one is a huge decision, but I believe that most families can make it work. It just takes a close look at examining priorities. Good luck to you and your family! I completely agree! If we don’t know someone who can use what we have, we’ll try to sell it. It if doesn’t sell then we donate it. There is no point holding onto something we’re not using anymore. A $1600 garage sale IS impressive! Nice work! Great posts, Monica. I know that one of my biggest money challenges is impulse shopping. Smart phones are wonderful but the ease of using an app to do everything from buy coffee to shop on Amazon is dangerous and tempting for me. Just ridding my phone of apps that enable me to spend money without thinking first has helped me to save. Thanks, Carissa! That’s great that you acknowledge that, Carissa! Avoiding temptation can be the best strategy for sticking to your goals. Thanks for reading!